A belated Happy Christmas and Happy New Year to all my readers! I took a much needed time out over the festive period and didnt get out much to take any outfit posts so apologies for my blogging break. But here we are in 2013, first post of the year! I love the beginning of a new year, fresh start, clean slate and a new found sense of motivation. This year is gunna be a big one for me, i have alot going on but hopefully i can keep on blogging. I wore this outfit on my anniversary which i spent relaxing with my boyfriend. The coat was a great sale find which i picked up for half the original price. Blue has always been my colour, i have blogged before about being a pisces and feeling most like myself in it. The colbalt shade makes this a statement piece which meant i could keep the rest of my outfit simple with navy and clinical white to compliment. Winter 2012 will stand out as the winter i went coat crazy! I picked up 6 in total but i also made some great investment buys like my 3.1 Phillip Lim mini pashli bag and Celine Trio Bag. This year my aim is to buy less, refine my wardrobe and work with staple and investment pieces. I think your style resolutions are really good ones..investment pieces have been on my list as well. I love the color combo..back, white and blue is perfection! this was the year of the boots for me...Manolo's , Atwoods, Geiger..Love them all! Blue is my favorite too. Loved the coat because of its color. You look fabulous. You look amazing from head to toe! Very Céline-ish outfit. 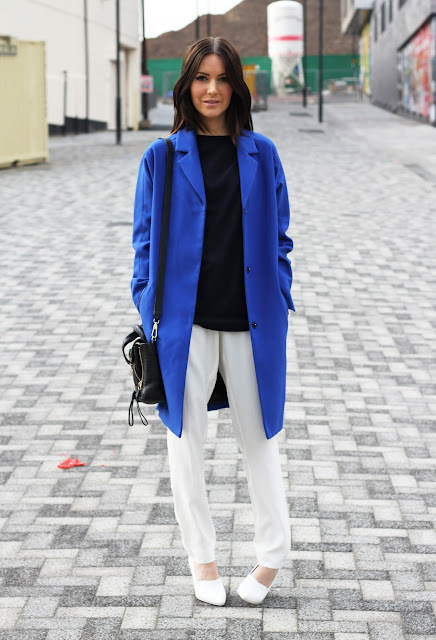 I love the coat and the colour and how you paired it with all white. Beautiful look! Your blog is amazing!! I follow you.